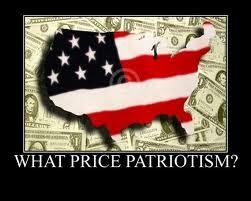 THE HIGH COST OF PATRIOTISM….. 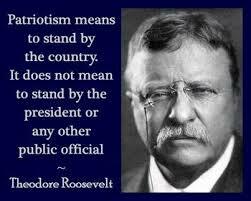 Throughout American history the ‘Price of Patriotism’ has been gargantuan and required incredible commitment and resolve to maintain. There are those today who suggest that conservative ideological beliefs, traditional family values, morality, and the U.S. Constitution are ‘outdated’ beliefs from a bygone era to be dismissed as things of antiquity. They laugh at what those of us who hold those values would consider ‘patriotism’ and consider us ‘domestic terrorist’ to be treated as common criminals and silenced. During the time the colonies were contemplating whether to ‘fight’ for Independence or remain subservient to the British Crown, American Patriotism was a costly position for one to adopt. It cost more than most of us could possibly calculate in terms of money, social standing, political standing, and physical safety. We find in studying history that a significant number of those who adopted the stance of ‘American Patriotism” lost position, property, family, and at times, life itself. Yet those who treasured Freedom considered it a price worth paying to secure Liberty for those living at that time and posterity. They considered it unacceptable to live in servitude to tyranny and although they looked for ways to compromise and reconcile with the Crown, they could find none that would not leave them servile so they opted to take the only steps available in an attempt to secure Independence, Liberty, and Freedom. Men from every era, ethnic background, social strata, and political stripe have at one time or another, in our history, demonstrated an understanding of the value of our unalienable God-given rights that were enumerated in the Constitution by our Founding Fathers. A document that begins “WE THE PEOPLE….” A document that identifies ‘Unalienable Rights’ and establishes means to hold tyrannical overreaching and intrusive government in check and insists that the ultimate power and authority of America belongs to the citizens thereof. Today, we have a government that does not believe that! We have a President that has gone around the World trashing this nation and people, and recently in Tanzania declared that the Tea Party and conservative Republicans who were conservative Christians, gun owners, and held to what he deemed to be antiquated ideology of morality and self-determination were a small group and fit the description of ‘domestic terrorist’. We have never had anyone serve as President of these United States who was so distant from American values as this man. We have never seen a time when so many, in high office, want to so radically transform our American Heritage into something that would dismiss the Constitution, invalidate our traditional moral values, and destroy the sovereignty of this nation bringing us into subservience to the United Nations or some World Governing Body. If we have ever had a time, since the American Revolution, when there was a need for True Patriots to rise up, band together, make their voices heard and have the resolve to stand for the long haul IT IS NOW! 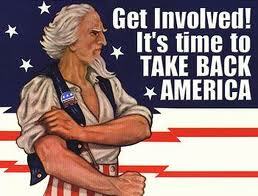 If we fail to unify as a voice of reason, demand and defend Liberty and Freedom we will soon have neither. Patriots it is in your hands! Your country is being destroyed and as Dr. King said if we see it happening and remain silent we are as guilty as those who are perpetrating it. We must be involved. We must be diligent in prayer. We must be committed to obtaining and retaining Liberty and Freedom. It is up to us. I do not have all the answers and sometimes feel I have no answers but I know one who does and to Him I am interceding for this nation. I want a nation in which ALL CITIZENS can have “Life, Liberty, and the Pursuit of Happiness.” I want a nation in which ALL CITIZENS can pursue the American Dream with a real hope that it is attainable. I want a Constitutional Democratic Republic as was originally established. JAMES MADISON’S TAKE ON PRESENT DAY POLITICS…. Oh I realize that I have to theorize to hypothesize what Mr. Madison would or would not have thought or said regarding today’s Federal Politics but I am taking that liberty based on history and his own words. As with anything that I or anyone else writes or says you have the right and liberty to choose to agree or disagree, but I hope to make you think and cause you to examine your perspective and views. I believe it is good from time to time to reexamine what we think and why we think it. When it comes to the ’lack of ‘transparency’ in contrast to what was promised by Barack Obama, that we would have the ‘most transparent’ administration in American history, I believe Mr. Madison’s own statements would help to conclude what he would think. Mr. Madison, in a letter to W.T. Barry in August of 1822 said: “A popular Government without popular information, or the means of acquiring it, is but a Prologue to a Farce or a Tragedy, or perhaps both. Knowledge will forever govern ignorance: And a people who mean to be their own Governors, must arm themselves with the power which knowledge gives.” Mr. Madison and our founders believed that it was not only good but mandatory that the government be forthcoming to the people and that it was not only good but essential that the people be informed. 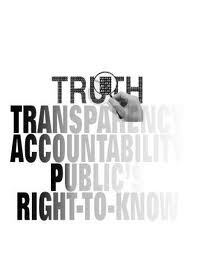 They realized, as should we, that this may require the public to do some personal research but one of the responsibilities of government and elected officials is to provide access to information in keeping the ‘public trust’. To suppress the ability of the public to know what is going on in Washington is the door to a “sham government” and will ultimately result in Tyranny. Yet, today we are afforded less information than from any administration in history and we’ve had some pretty tight lipped administrations. Sadly, too many voters just do not care so long as they get their handout or piece of the pie. When it comes to indiscriminate spending, welfare, subsidies, and some of the most outlandish expenditures in foreign aid I believe that Mr. Madison would have been outraged at what is happening. Again, I go to his, own words as a basis for my conclusions which were echoed by many of our founders. Mr. Madison said, in a letter to Edmund Pendleton January 1, 1792 – “If Congress can do whatever in their discretion can be done by money, and will promote the general welfare, the Government is no longer a limited one possessing enumerated powers, but an indefinite one subject to particular exceptions. It is to be remarked that the phrase out of which this doctrine is elaborated, is copied from the old articles of Confederation, where it was always understood as nothing more than a general caption to the specified powers, and it is a fact that it was preferred in the new instrument for that very reason as less liable than any other to misconstruction.” Mr. Madison did not view the ‘general welfare clause’ to mean that Congress or the President should take tax-payer funds and use them to redistribute the wealth to people creating a Nanny State. Mr. Madison’s objection should serve as a clear warning and evidence that the framers did not believe, as is being proclaimed by many on the left, that the ‘general welfare clause’ was a license for Congress and/or the President to create a Nanny State nor did they believe that every citizen had a right to ‘happiness’ as some have said only that they had the right to PURSUE HAPPINESS unimpeded by the Federal Government. Mr. Madison also said regarding using tax-payer funds for benevolence, “I cannot undertake to lay my finger on that article of the Constitution which granted a right to Congress of expending, on objects of benevolence, the money of their constituents.” In the Annals of Congress, House of Representatives, 3rd Congress, 1st Session, Page 170 (January 10, 1794). The Annals summarize speeches in the third person and Mr. Madison’s statement is as follows: “Mr. Madison wished to relieve the sufferers, but was afraid of establishing a dangerous precedent, which might hereafter be perverted to the countenance of purposes very different from those of charity. He acknowledged, for his own part, that he could not undertake to lay his finger on that article in the Federal Constitution which granted a right of Congress of expending, on objects of benevolence, the money of their constituents.” The expense in question was for French refuges from the Haitian Revolution. I am convinced that our Founding Fathers would be totally opposed to what is taking place in Washington today and has been the norm for some time. They wanted a very restricted and limited government and believed that any law or action MUST be in harmony and in obedience with the written Constitution of these United States of America. 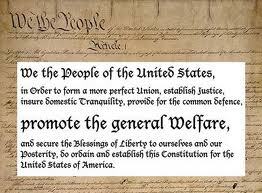 This is foreign to most members of Congress and is most assuredly foreign to this President and his Attorney General. We need men and women in Congress who will completely and strictly uphold the Constitution, follow the Rule of Law, and do what is right for America and Americans. We, as citizens, need to pray diligently for our nation and seek the mercy and grace of God in these troubled times. WHAT EXACTLY IS IT THAT THIS ADMINISTRATION WANTS TO HIDE…. Forgive me but that statement or question is so open ended one could go in a myriad of directions, and time nor tolerance would not allow me to exhaustively pursue it so I have one thing in particular in mind – Benghazi. What is it about Benghazi that Barack Obama and his agencies within the government are so vociferously laboring to keep from Congress, the media, the American people and the world? It must be enormous for them to go to the lengths they have and are going to. 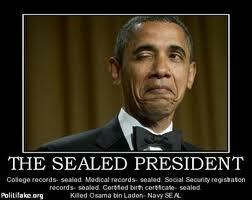 What is it about this ‘phony scandal’ as Mr. Obama has labeled it that is so damning he dare not let the truth come out? It must be of epic proportions and more than just negligence because he has survived over four years of negligence and come away unscathed. There has to be something so revealing that he, the State Department, the Department of Justice, the FBI, and the CIA are working overtime to insure that it remains hidden. What is it? 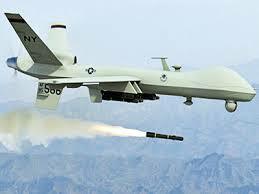 Obviously, I do not know or I would be on the national scene and would be an immediate target of a drone assignation. So, I openly declare that I do not know for sure but I am convinced that it must be something more than just dropping the ball, incompetence, or negligence. It is far more sinister than that or they would not be going to the lengths they are to keep it hidden. CNN, of all sources, broke a story that the CIA is conducting monthly polygraph examinations on the survivors or agents who were in Benghazi to insure that they have not leaked any information to the media or Congress. Why? If it was a poorly produced and virtually unnoticed video that sparked this that would certainly not be necessary. If it does not make any difference as suggested by Hillary as she angrily asked, “What difference does it make now?” That would not be necessary. If there was not chance or possibility of us rendering aid and support to the embassy and its inhabitants in time, this would not be necessary. Why have they been relocated and even had names changed and are deemed to be in ‘witness protection”? Why? CNN said sources informed them that the CIA had more than 20 agents at or near the U.S. consulate in Benghazi when Ambassador Stevens was killed. In fact, the sources say that the CIA had 22 people in their annex the night of the attack. Why 22? Is this a normal number or was something else going on that Congress apparently did not know about. Was this some covert under the table and behind the scenes operation? I wish I knew and so should Congress, the media, the world, and the American people. One source told CNN that there were 35 people at the consulate and annex with 7 of them wounded. Obviously they knew it was an organized and well- orchestrated terrorist attack not some spontaneous riot as the result of a film or anything else. What is it they do not want us to know? Let me float a possibility, one that came up in the very beginning and Senator Rand Paul asked Hillary Clinton while she was under oath if the United States was involved in transferring weapons out of Libya to Turkey or any other nation. Hillary attempted to brush it aside and he persisted. She then deflected it to the CIA or some other agency declaring that she did not know. With all that is being revealed by one of the most liberal and Obama friendly sources, CNN, one would have to ask, is this possible? We already know about ‘Fast and Furious’ a scandal and ‘illegal gun running scheme’ that Obama and Holder have been dirtied by. We know that Mr. Obama does not regard Congress, the Constitution, or the Law as a restraint for him because he has demonstrated he believes he is superior to any of those. I do not know if this was another ‘illegal gun running’ operation conducted or authorized by this President but it is something so dangerous to him and the Democrats that they are pulling out all stops to keep it secret. If the Republicans and any Democrats who even remotely want to keep our Constitution intact and desire to serve America do not press forward and get to the bottom of this they should be booted out of office immediately. 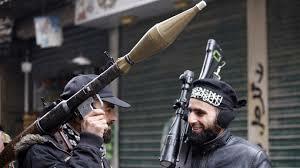 If Barack Obama was involved in an ‘illegal unauthorized gun running’ scheme to provide arms to the Syrian rebels he should be indicted and tried on the charge of treason. As a concerned American citizen I am ramping up my DEMAND to my elected officials that they pursue this with all the power and influence they can muster. This Obama labeled ‘phony scandal’ is far from phony and IT MATTERS! May God bless you and may God guard and guide America.